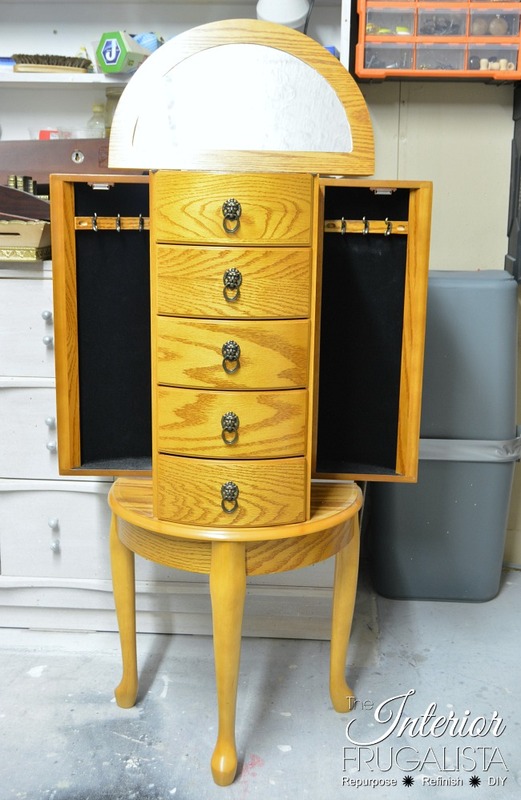 Last Fall when sorting through Mom's things in preparation for her move to a long-term care facility, taking her Queen Anne jewelry armoire was not an option. My sister, in need of a larger jewelry box, was the lucky recipient. 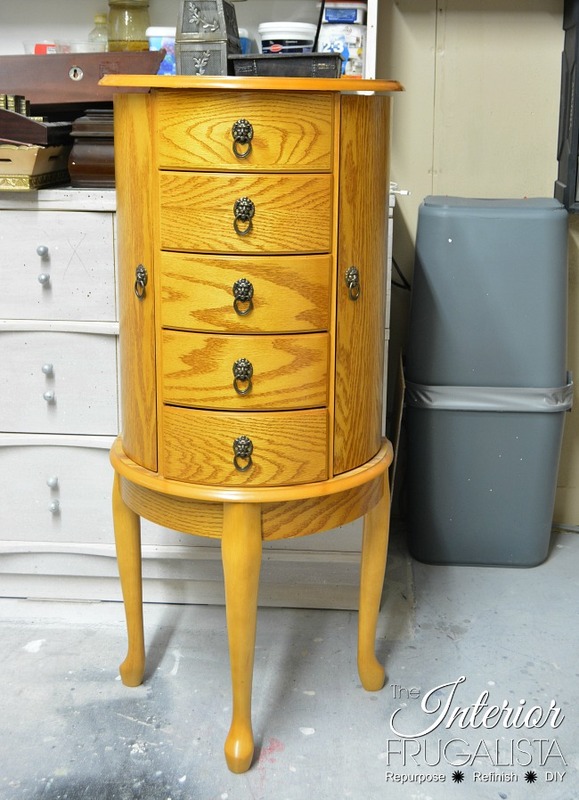 Not a fan of the golden oak, she recently asked if I would refinish it for her and so Mom's floor standing jewelry chest got a makeover. 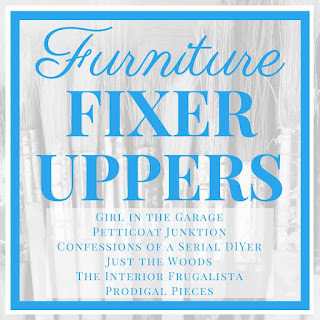 Before I get into the makeover details, did I mention, today is Furniture Fixer Uppers Day? 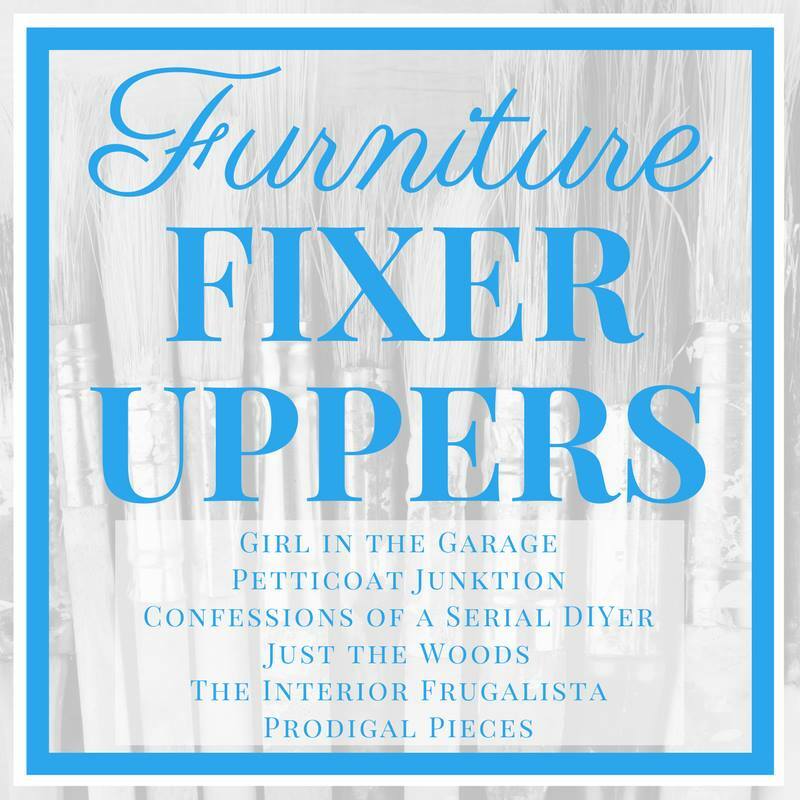 What that means is that five talented and creative bloggers have come together to breath new life into five furniture pieces that had seen better days. Normally we would have six to share but Larissa from Prodigal Pieces had to sit this months challenge out. In case you missed last months challenge, I transformed an office bookcase into a Farmhouse Cupboard. After a bath in vinegar and water and a towel dry, I dismantled the hinged parts of the cabinet. Next, I removed each drawer and labeled them with painters tape. I'm a bit of a bull in a china shop when it comes to painting - some might argue life in general. The black felt inside the armoire was in excellent condition and so to protect it from my sloppiness, I ran painter's tape along all the edges. I left the original hardware on because I didn't plan on replacing them and from my experience, those soft little screws strip quite easily. 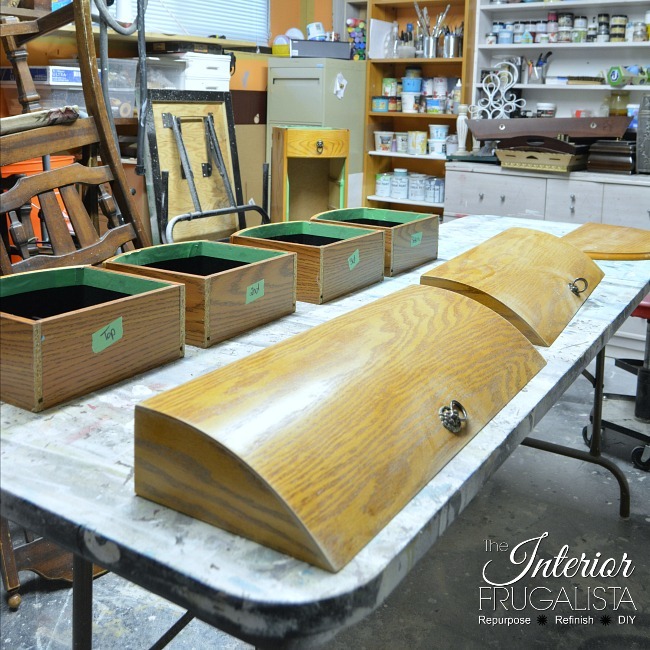 With some chalk paint, it doesn't require priming, de-glossing or sanding first. I put that to the test by painting without prep and doing the scratch test 24-hours later. If you run your nail across the paint and it doesn't peel off, you've got good adhesion. 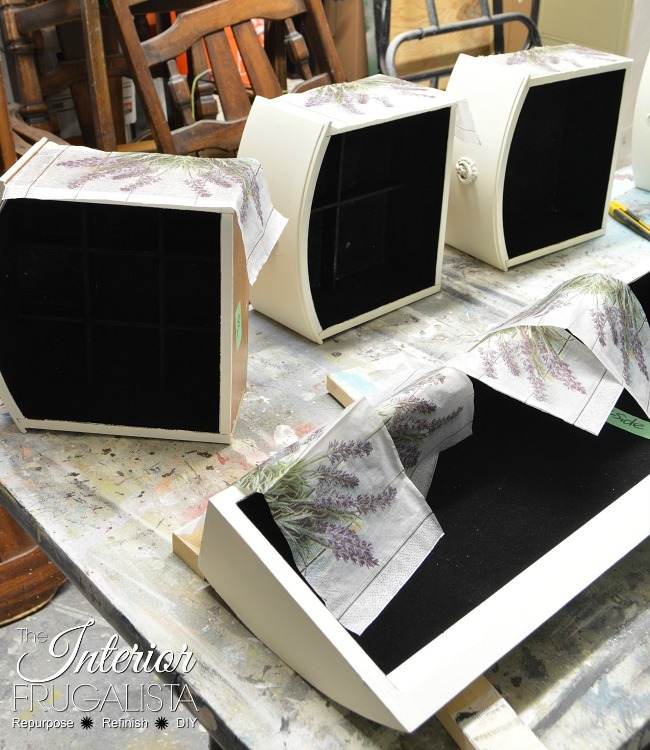 My sister wanted a distressed shabby chic finish but rather than the golden oak showing through the distressed areas, she wanted black. I gave the chest an undercoat of chalk paint in the color Graphite, a dark gray. Over the charcoal gray, I chalk painted three coats of Old White. You can see the black underneath after distressing. Although in some areas where I sanded back more than others you can see the golden coat peering through. I also distressed the lion head drawer pulls. 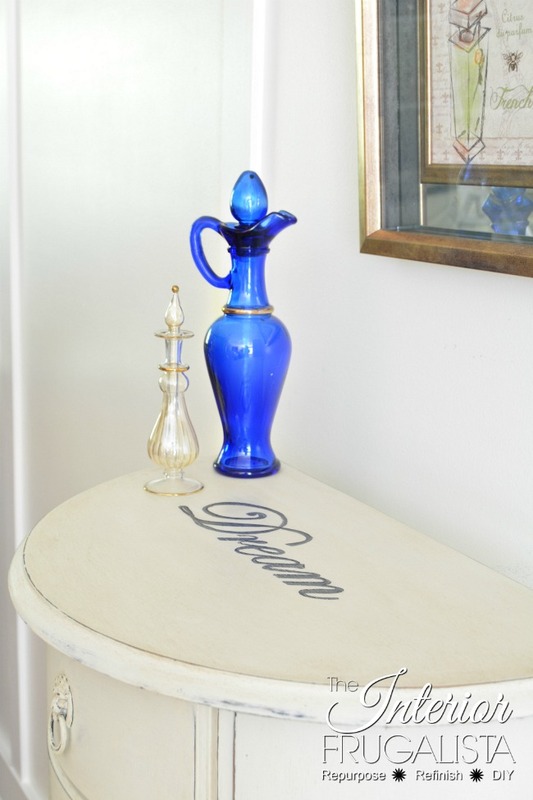 My sister asked if I would add the word DREAM onto the top because the jewelry armoire would be used for her costume jewelry in her bedroom. I had some dream decals in my stash that I liked the font. Not wanting to simply pop a decal onto the lid, I transferred the typeface by placing a sheet of graphite paper underneath and traced it with a pencil. You can't see the pencil mark so I can still use the decal on a future project. Using craft paint and a script liner art brush I handpainted the graphic. 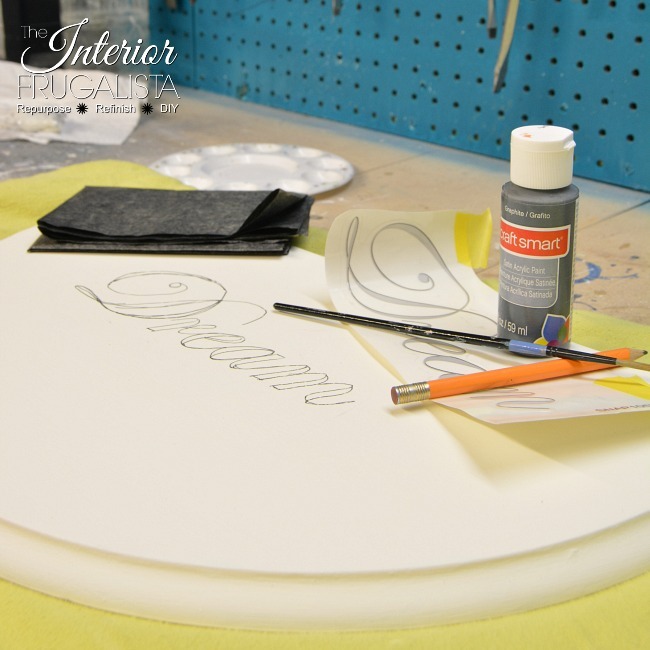 I always like to add an element of surprise on the inside of my furniture makeovers. For this piece, I chose dollar store napkins. 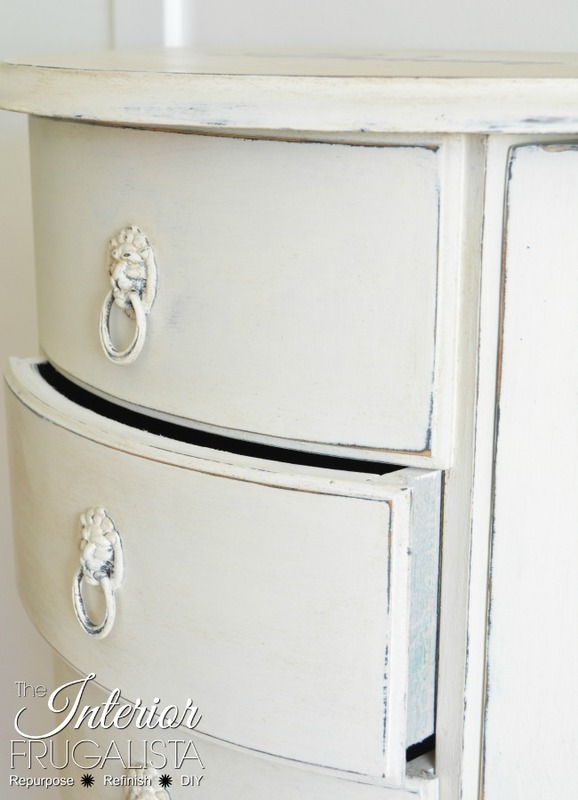 But first I painted the sides of the drawers with a coat of Old White chalk paint. Napkins are 3-ply and so before decoupaging, you have to remove the extra ply, thus making the paper quite transparent. Had I not painted the sides of the drawers, the golden oak would peer through the paper. Ahem, ask me how I know. Oh and one more thing, make sure the pattern on the napkin is facing upwards towards the top of the drawer. Yeah, ask me how I know that too. But first, before separating the napkins I cut them in half horizontally. This made it very easy to pull apart the layers along the cut line. Next, using a foam brush I applied a thin but generous coat of Mod Podge onto the sides of the drawer. You have a little play room with a thin napkin and so I eyeballed the placement and essentially dropped it in place. Very carefully I adjusted the napkin and dabbed the spots that didn't have good contact with my fingers, not worrying about wrinkles. 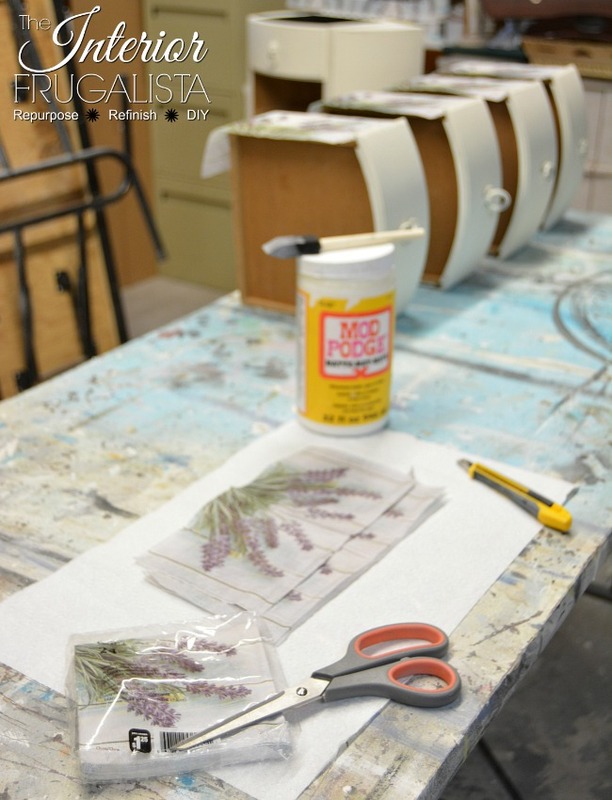 Once the Mod Podge was dry I used a craft knife to carefully cut the paper to size. To protect the napkins from the drawers sliding open and closed, I brushed Mod Podge over top the paper. Note: make sure you have a generous amount of Mod Podge on the brush or you risk tearing the paper and whatever you do, don't go over the same area twice. 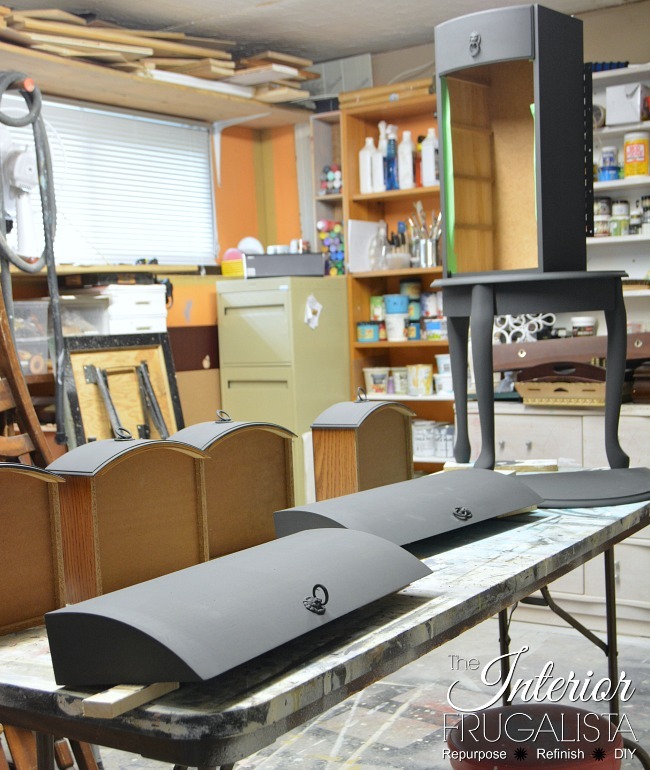 After it dries use fine 220-grit sandpaper to smooth along the edges. I repeated the same process around the mirror on the inside of the lid. Using a lint-free rag, I applied clear wax over the painted armoire. Next, I grabbed my go to horsehair shoe brush to buff the wax, forgetting that the last time I used it was on my sister's Black Handcrafted Table to which I had applied dark wax. Oops, the plan was to have a clean look on this piece but I was loving the depth the dark wax was giving the creamy white. So I kept buffing the dark wax all over the cabinet, without reloading more onto the brush. The subtle antique finish is so pretty. My sister doesn't know I changed the plan but she'll find out when she reads this post. Hi Carol, I hope you like it? If you've been reading this blog for any length of time you know I'm all 'bout the legs, bout the legs. I'm quite pleased with how Mom's jewelry chest looks now. Goodbye golden oak - hello creamy white. 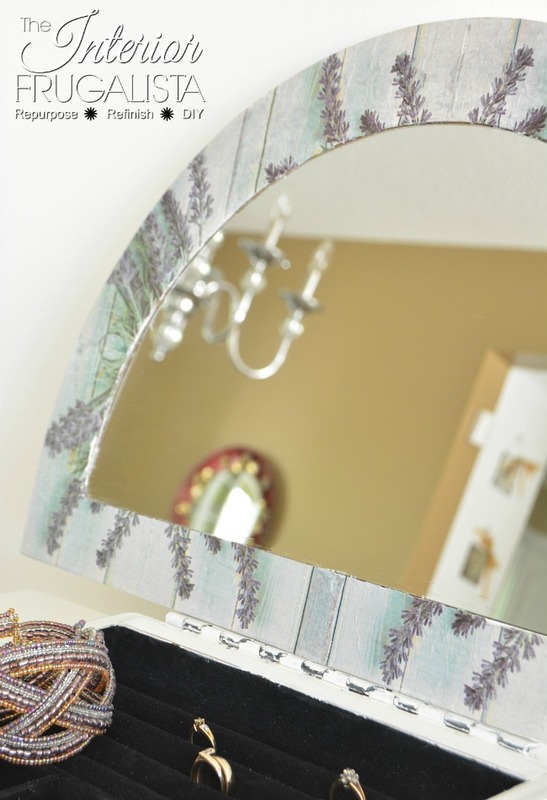 I wish my Mom could see her jewelry armoire and have the ability to tells us what she thinks of the makeover. Alzheimer's robbed her of that. If decoupaging with napkins makes you nervous, try it on a small inexpensive item like I did on this Dollar Store Birdhouse. I had just as much fun giving this floor standing model a makeover as I did with all the little jewelry boxes I've done over the years. I call them mini furniture makeovers. 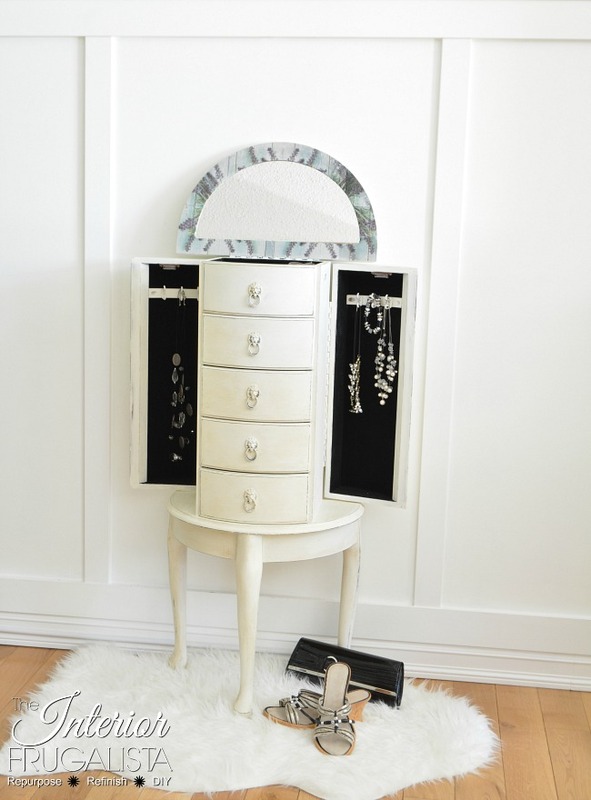 Like this Jewelry Box Repurposed Into Remote Control Storage and Mint Vintage Jewelry Box Makeover. 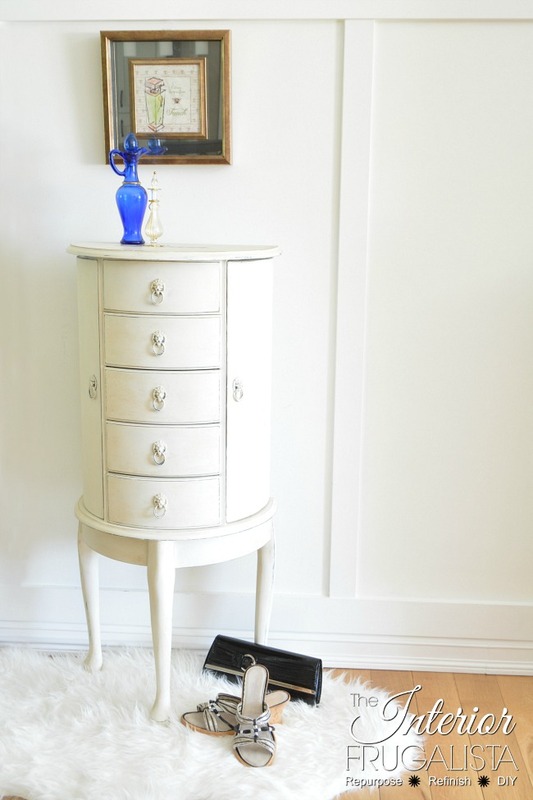 If you enjoyed this Queen Anne Floor Standing Jewelry Chest Makeover, please share it with a friend and/or save it on Pinterest. 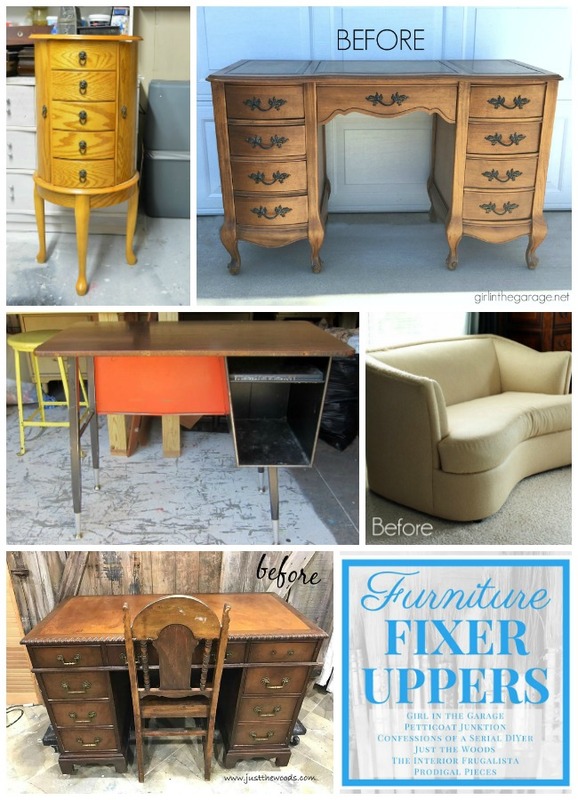 I'm so excited to see what my talented blogging friends did with these furniture pieces. I do have one, stuck in my closet for years, mostly because I didn't have any room for it, but if it looked as good as yours I might let it out! Love that jewelry box! What a pretty finish - I like it much better in white than the golden oak (I am not a fan of the wood grain visible in oak wood. Cherry wood and maple, even walnut, are pretty in solid wood stains, but I do NOT like oak. 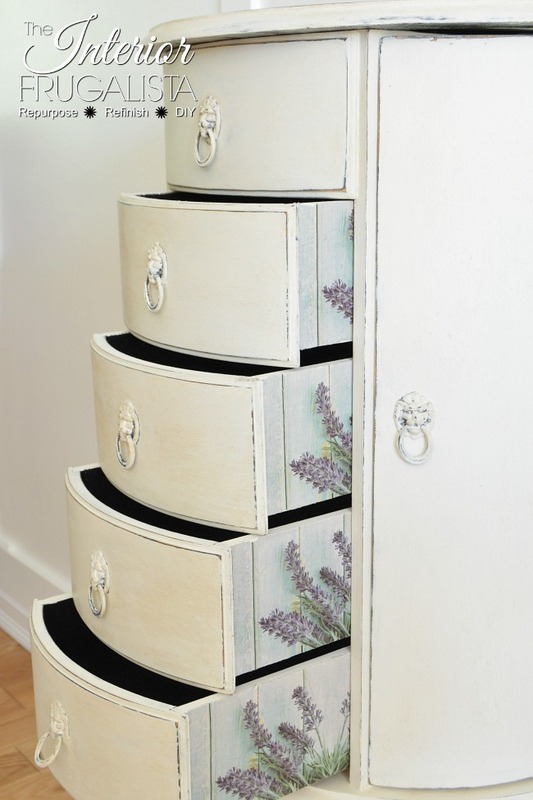 I adore the lavender stems/flowers you used on the sides of the drawer. I bet your sister is gonna love it! Hi Barb 😊 Yes, that golden oak had to go! It was fun decoupaging the sides of the drawers and I plan to do that again soon. My sister loved it!